When my husband is home I'm pretty good about writing out menu's and grocery lists. When he's gone I, more often than not, stand in front of the cupboards wondering what I am doing at the last minute. 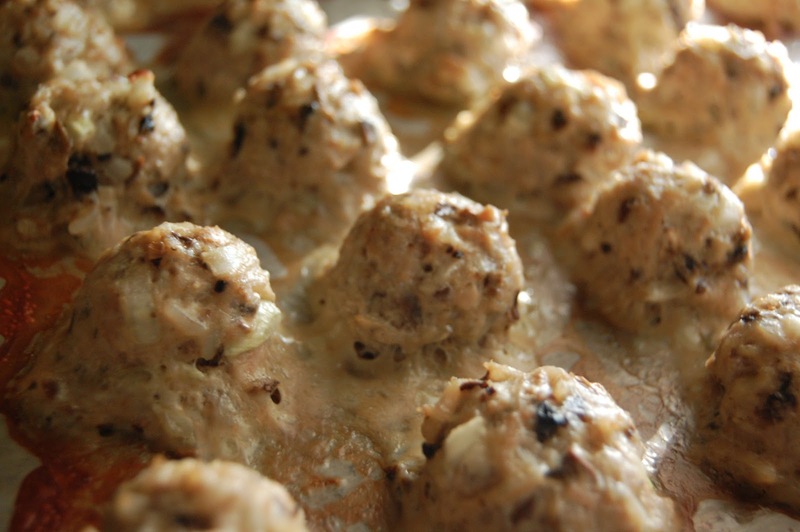 These chicken meatballs were another one of those random awesome happenstances. Here is what I threw into a bowl in a rush to feed my hungry little monsters. 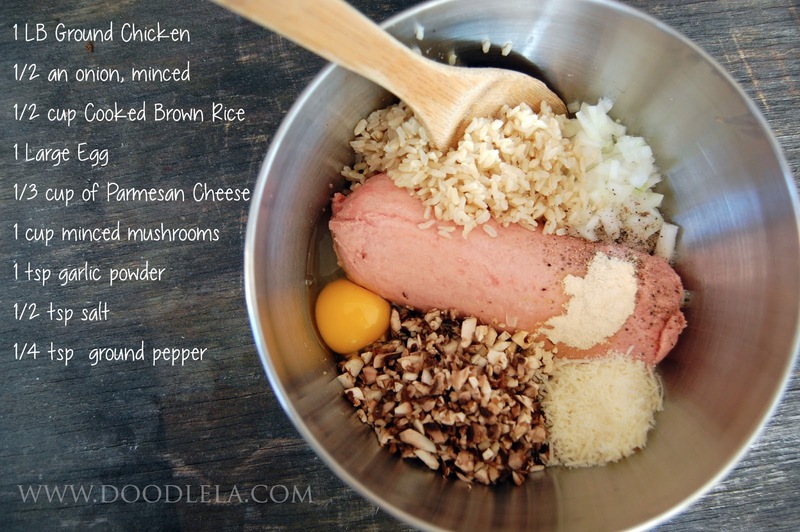 Mix everything together with a wooden spoon, or your hands work well, too. I often use clean hands for mixing, you know, since I'm the one doing most of the cleaning and all of the cooking! 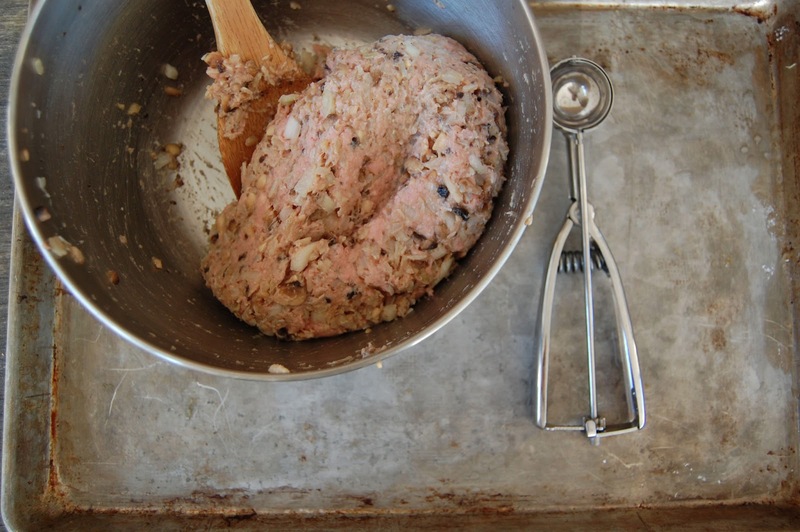 Using a tablespoon sized scoop, fill up your pan with meat balls. I didn't squeeze them together with my hands at all. They hold their shape pretty well just through the scooping process. However, I did pack that scoop pretty full. Place the meatballs an inch or so apart. I filled my pan with about 40 meatballs. That's way more than my kids and I can eat. Although, my youngest did skip eating his pasta and kept snagging meatballs off he pan. I think he ate half of them all by himself. Oh, and they make awesome leftovers. You may want to line your pan with parchment, or spray it with a little oil. They do stick a little bit, but it wasn't anything too serious. They came off pretty easily with a spatula. You're going to pop these babies into the oven at 350 degrees for 30-35 minutes. 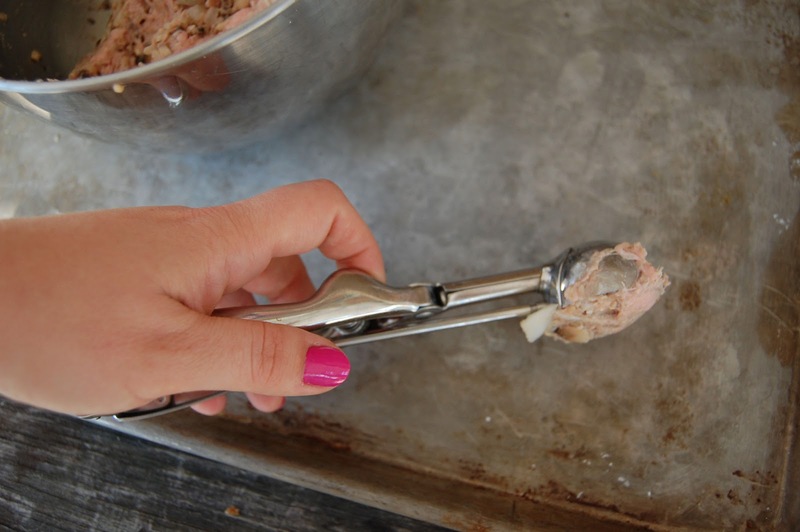 Use a meat thermometer to check temp before pulling them out. 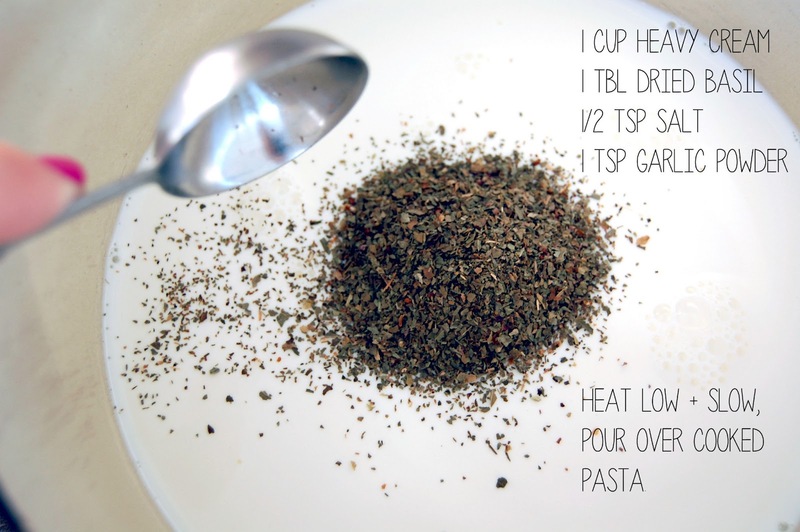 While your meat balls are cooking, and towards the end of their cooking time, you are going to heat your Basil cream. Don't let your cream boil. You just want to imbue your cream with the Basil flavor, so low and slow is the way to go. 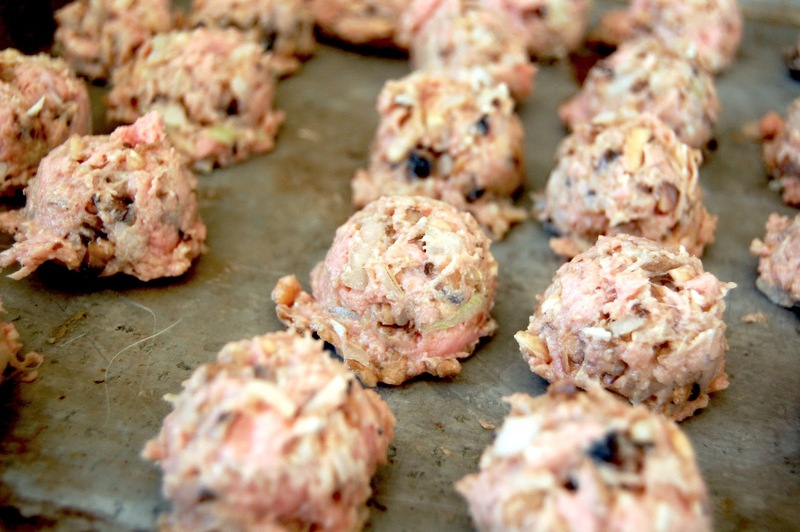 When your meat balls are done, pull them out and let them sit a minute to let all those juices get locked in. 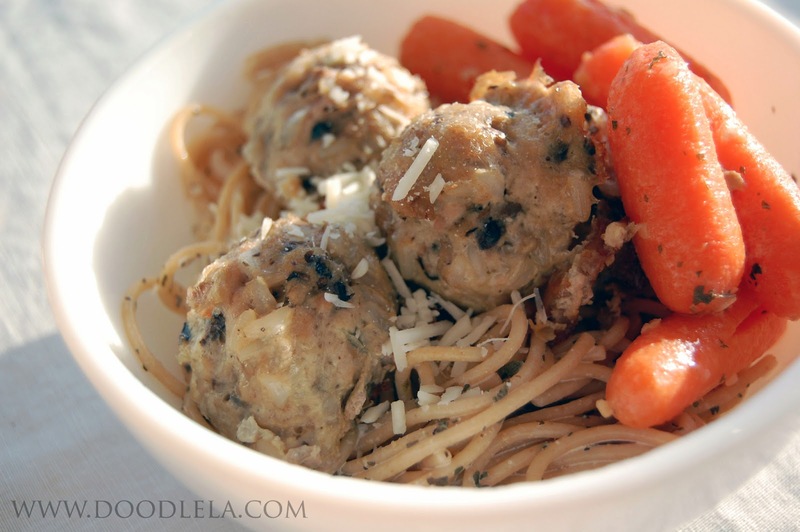 We had our meatballs served over whole wheat thin spaghetti, with some carrots on the side. It was filling and really yummy. If you try this recipe, I'd love to hear from you! Let me know how you like them. These sound sooooo good!! Especially the basil cream! Can't wait try it. Found you on the somedaycrafts hop, so glad I did!! These sound delicious! I'm pinning this right now! Found your blog through Backyard Produce's Facebook. After reading this and knowing I have to make the menu for next week soon, I definitely plan on adding this to it. Looks super yummy!